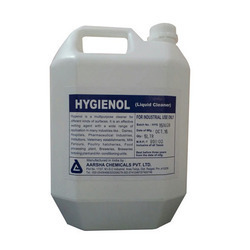 Leading Manufacturer of hygienol liquid cleaner from Navi Mumbai. We are a renowned manufacturer in the industry, active in supplying an excellent stock of Hygienol Liquid Cleaner. Our highly experienced team has thoroughly inspected the quality of our cleaner on standard industry parameters. Widely used in hospitals, homes, commercial places and other public areas for cleaning floors, toilets and wash basins, it is offered to clients in excellent air and leak tight packaging. We are offering this General Purpose Cleaner to our clients at nominal price.